I am so excited! Christopher just turned 11 months old and he has started to clap. It is a little different clap, he holds his left arm close to his body, holds out his hand and then pats it with his right hand. We have been working so hard to get him to clap since his 9 month check up. It's difficult for Christopher to move his left hand because he has hemiplegia (paralysis or weakness on one side of the body). 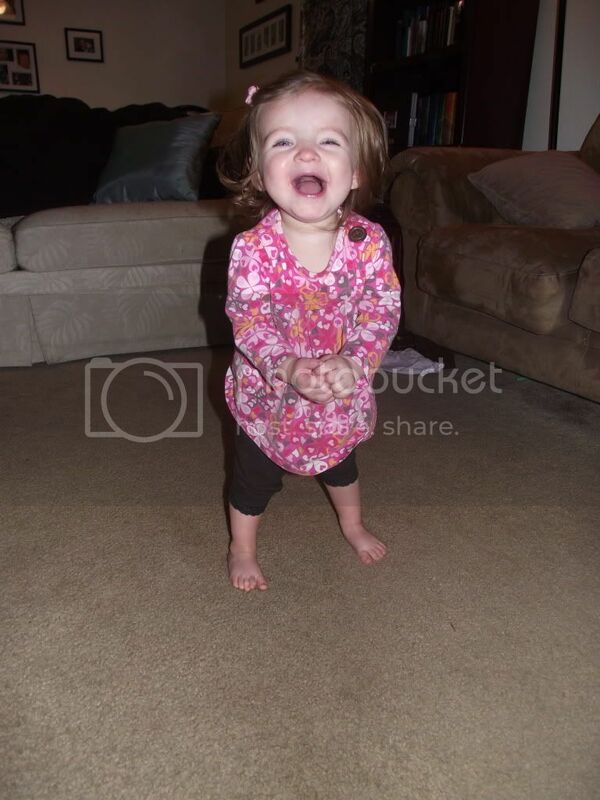 Brooke was about 7 months old when she was diagnosed with Hemiplegic Cerebral Palsy. After a great pregnancy, labor and delivery, this was a huge shock to us, and left us completely off guard. 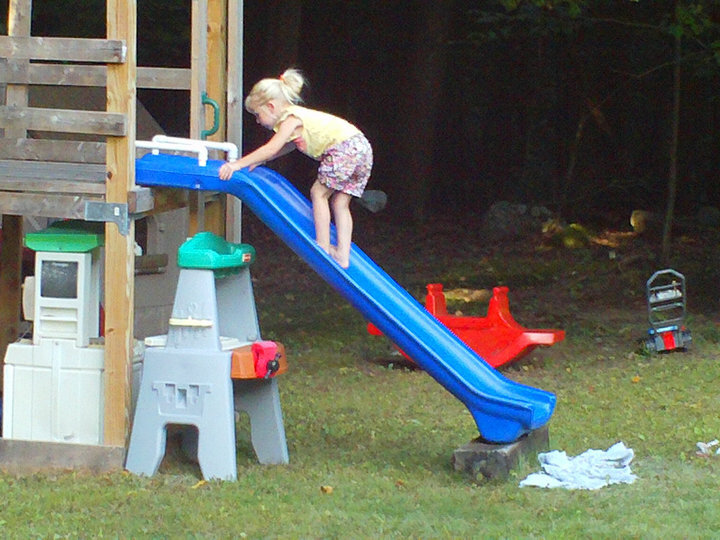 Her doctor told us all of the things she would never do, like crawling, walking, playing piano. We all took it very hard. Our family banded together and have been working with her a great deal, along with her Physical Therapist. Around 10 months, she started "Army crawling"; at 11 months she pulled herself up to stand at the couch; around 12 months she started regular crawling (after trying and trying and trying); and has just recently at 14 months started to stand on her own for a couple seconds and has even taken a couple steps! It has been a very long road, and we have just begun. We are so proud of our little girl and all the progress she has made, and look forward to seeing all the things we know she will accomplish. She is very strong willed and will do anything she puts her mind to, one way or another. She has already proven her doctors wrong and we wouldn't change her for anything. ~Brooke's extremely proud and grateful mom. Nathan and his twin Jacob were born 4th of July 2002 at 29 weeks. Shortly after birth Nathan suffered a Grade IV brain hemorrhage. As a result he has left hemiplegic cerebral palsy. Nathan is currently in the 3rd grade and doing very well. I want to share his story of hope as it has not always been so easy and there were many days when we wondered how Nathan would do as he grew older. Nathan has been competing in the Empire State Games for the Physically Challenged the past three years. His first year he took home 7 gold medals - a medal in each event he entered. The second year he earned 8 gold and again this year 8 gold medals for Nathan!!!! This year he won gold medals in the 40M, 60M, 100M dash, distance kick, soft toss, precision throw, and bowling. Nathan also has been taking Karate for the past 2 1/2 years and was promoted to rank of blue belt in September. 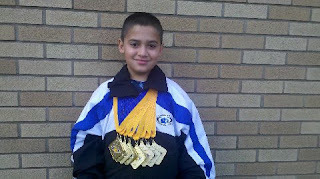 He recently competed in a tournament for Karate with typically developing children and did an awesome job. Here is a video of Nathan from that Tournament. 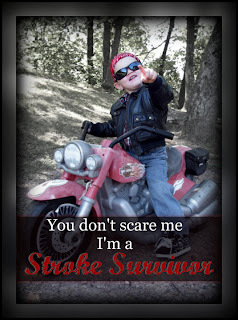 Pediatric Stroke Survivor is a Grand Champion! Thomas rides in a program called "We Can Ride 4-H Club." He has been in the program for about 8 years. This year he won Grand Champion in Showmanship. Showmanship is where you walk the horse to the judge and show him or her that you have control over the horse. You need to make eye contact and smile, which is very hard for Thomas, but he pulled it off and won Grand Champion. The club always ends the season with a show at the County Youth Fair where Thomas ended up with an awesome third place in riding, which is AWESOME. Thomas now rides with only a spotter, no more side walkers and we are trying to get him to do it by himself. Thomas is 15 and a Sophomore in High School. Thomas also survived a pediatric stroke. Jeven has had a love of motorcycles since he was an infant. He wants in every way possible to be just like his daddy, and since daddy rides and loves motorcycles of course that means Mr. Jeven wants to ride one too. The problem with this was that Jeven had a stroke in utero and as a result suffers from hemiplegic cerebral palsy with very poor balance and little to no use of his right hand. It broke our hearts to think that our son may never be able to pursue his biggest passion in life so far. Little did we know that Jeven had other plans. With the help of botulinum toxin injections, hard therapy, and my little boys strong will and courage, Jeven can now hold onto his "Harley" with both hands. This may seem insignificant to some, but to us it means he is one step closer to his dream. I have no doubt that my boy will make it. No stroke or cerebral palsy can stop him! Danny had played on a competitive football team for four years, but the time came for school ball. The program in his school is fierce, large, strong and competetive. About 60 boys tried out for 35 spots. We cheered him on, but told him there is no shame in being cut... if that happens. Team selection day came and Danny made it!! He proudly wears #42 (see him in the photo?) and works hard in practice. He has had to overcome sore feet and blisters becuase of his AFO. For parents wondering aobut sports for their kids, we suggest to let them do whatever they want. Anything is possible. Many people question our decision to let Danny play tackle football. I question it too sometimes, but I cannot bring myself to tell him no. And the smile on his face when he is on the field lights up the world. 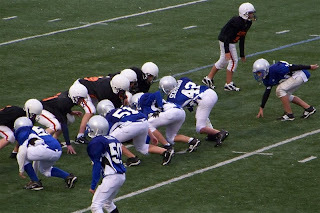 ~Proud mom to #42 on the 7th grade team! 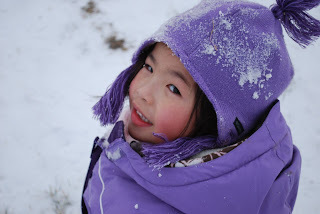 Megan, 9, suffered a stroke in utero and underwent a partial left hemispherectomy at the age of 15 months. She has also had tendon transfers on her right arm and leg, eye surgery and she wears a brace on her right leg and hand. Megan doesn't know the word "can't" and we let her try anything she wants to try within limits! Megan latest role is that of proud big sister! Baby sister Ashlynn was born in September of 2009 and as you can see from the photo, Megan loves her role as big sister! Loo Loo, Skip to my Loo! stroke in June of 2010. Today she brought a note home from her PT at school. It said they had been working on skipping, just a few short weeks ago, she couldn't even hop on her left leg and now she is skipping!! Her PT said she was so proud of her and continues to be amazed by Maya's progress. Our little miracle continues to amaze us every day! Ryan loves racing in his kart and it is something that has helped him use his feet and his hands with coordination. His racing has given him great confidence and only his very close friends even know that he has a disability. Patrick, 10 years old, had a stroke at birth due to trauma. Doctors anticipated that Patrick would never run, never play sports and would need to go to a special education school. After years of OT, PT and speech five days a week, Patrick is now attending "regular" school in the 4th grade and on the honor roll! Not only is he excelling in school, he also plays basketball three days a week and has learned to ski without any adaptation. He is now mastering snowboarding with the help of assistive tethers. 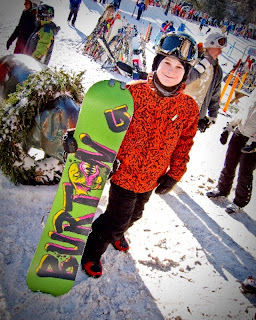 As you can see in the picture to the right, he is the proud owner of a new snowboard! His dedication and spirit inspires me every day! A few nights ago I was taking a shower and Joe (age 5) was watching TV in my room. After my shower I saw that he was up on the bed...no big deal...until I noticed that the step stool wasn't up to the bed. I asked him how he got on the bed and he giggled and said "I climbed." Our bed is just a regular bed, not higher than the standard, but Joe has never been able to get on it...I have either had to pick him up or he has had to use a step stool. Each night since then he has climbed up on the bed and then has said to me "Ask me how I got on the bed." It's amazing how these "little" things can be so BIG. Megan is a nine year old in utero stroke survivor who underwent a partial left hemispherectomy at the age of 15 months and eye surgery at the age of five. She has had tendon transfers on her right arm and leg, she wears a DAFO on her right leg and a brace on her right hand. Megan is an amazing child who never gives up and sees the good in everyone and everything. We truly can see God's love through her eyes.